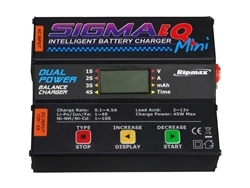 The Sigma EQ Mini is a compact, high-performance, micro-processor controlled, fast or slow charger with built-in Lithium balancer circuitry. it is suitable for charging Li-Ion, Li-Po, Li-Fe, Ni-MH, Ni-Cd and Lead Acid batteries from an 11 to 15V DC or 100-240V AC power source. 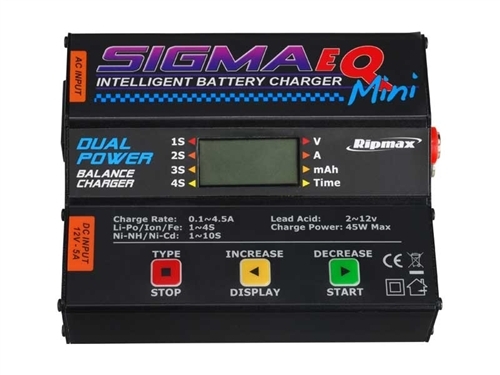 With a maximum internal circuit power of 45W and a variable charge current of up to 4.5A (3.2A for Ni-MH), the sigma EQ Mini is a versatile and easy-to-use unit. The clear LCD display shows all data and is simple to use for selecting charge parameters. The charger is supplied with a special multi-plug style balancing adapter board to suit Hobby People, Hobby King, Integy, Intellect, Hi-Energy, Flight Power, Thunder Power, and many other batteries. Hobby King, Integy, Intellect, Hi-Energy, Flight Power, Thunder Power are trademarks of those companies/brands and are not affiliated with this product.